The Religious Education Program has been busy bringing holiday cheer! For Thanksgiving, the program partnered with a FDNY firehouse in Jamaica to bring Thanksgiving meals to 30 families who use the food pantry at St. Nicholas of Tolentine Parish, Jamaica. Each of our grades was tasked to bring a portion of the meal’s sides: canned vegetables, stuffing, mashed potatoes, yams, dessert. 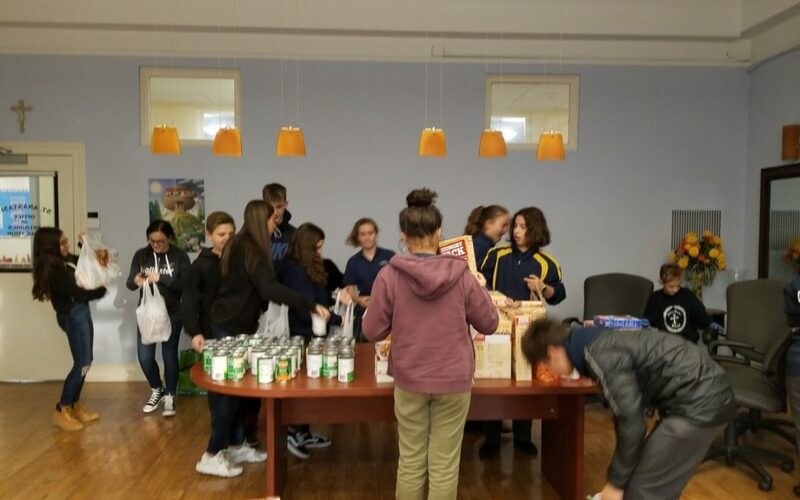 Some of our eighth grade confirmation students from the program and Divine Wisdom Catholic Academy helped in packing the meals into bags for distribution. Our program also made Christmas and holiday cards with special messages for the residents of Brandywine Senior Living on Little Neck Parkway. The cards were given out at a special performance.